Updating your home can be an overwhelming, but an extremely exciting process. If you are planning on fixing up your half bath and do not know where to start, we have the perfect guide to help you. Half baths are usually one of the smallest rooms in a home. Take advantage of the low cost of materials for such a miniature space and replace the floor! This room will be one you will love to show off to guests, so make sure it stands out. Don’t try to use small-format tile here, though. Using large-format tile will open up your space, making it feel larger and less cluttered. Vanity sinks are the perfect choice for small bathrooms because they have practical storage and hidden plumbing. 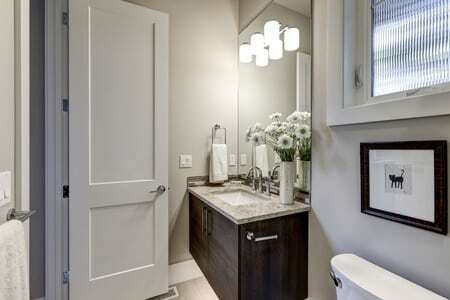 Homeowners can store toilet paper, cleaning supplies, and toiletries in their vanity sink. Plus, these sinks are super stylish. Make sure to put a trendy mirror above the vanity sink to complete the look. Update with a High-Efficiency Toilet. You can find your perfect toilet at your local home improvement stores. Upgrading a toilet can complete the functional use of the room. If you have an old toilet that does not work well, guests and other household members may avoid using that bathroom. Plus, changing your toilet can transform the design aspect of your room. Pro-tip: If you are replacing your currently old toilet with a new one, you have a couple options for your old toilet. You can donate it to a Habitat for Humanity resale store or you can recycle it. Just check with your local recycling center or water conservation office to see if they take old toilets. Odds are that the lighting is outdated and the room is in need of some new light fixtures. Upgrade your light fixtures to allow more light into the room. Half bathrooms should be well lit because they are so small. Whether you are changing or keeping the current wall color, you should apply a fresh coat of paint. If you are redesigning the room, it is a great idea to change the current wall color to go with your new design. Don’t restrict your tile to the floor. Decorative tile on one wall makes an eye-catching feature wall! Put in The Finishing Touches. Add your finishing touches to the room. A great idea is to install a towel rack and a toilet paper holder. Buy some new hand towels and soap dispenser to give the room a fresh look. Finish the look off by hanging up a picture or two to complete the room’s overall look. We would love to help you choose the perfect flooring for your project. Visit us online or at one of our locations for more information! We look forward to working with you.